Railway Singers were joined by Sing! Community Choir and primary singers in walking distance of Mill Road, from St Matthew's School, Ridgefield School, St Philip's CofE and Abbey Meadows Primary Schools. Huge thanks to everyone who came to join us for the free participatory concert when we showcased the pieces commissioned for the project as part of Mill Road Winter Fair to celebrate this unique Railway History! It was a great event including gospel and soul numbers, folk songs and much more! We are making a short film summing up the concert, but meantime please find a description of the event and a slideshow of the photographs from the concert shown below in this blog! The morning started with us gathering together on the 'stage' area to warm our voices for the rehearsal, with child-friendly numbers including 'I do not like brussel sprouts, but cabbages are green and so are peas" which got everyone in the mood for a fun-filled morning of wordplay at the same time as stretching our voices up and down the scale!! During the rehearsal, Mario skipped through the running order swiftly, so everyone got used to several choirs joining forces. It was wonderful to have for the first time the Sing! 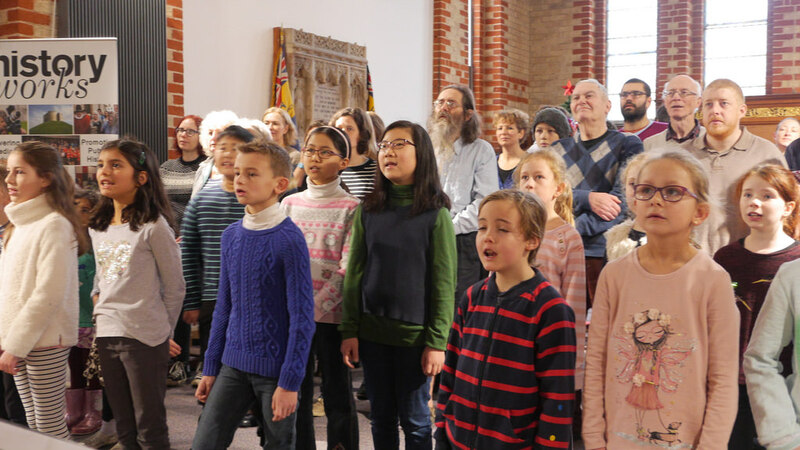 Community Choir joining not only with the Railway Singers, but also with the junior voices from the primary choirs, mostly comprising of the enthusiastic St Matthews Primary Choirs, and keen singers from Ridgefield, St Philip's CofE and Abbey Meadows Primary Schools. The singers took a break at 10.45am for cookies and cake and juice provided by Historyworks, as the audience also took their seats. The hall at St Philip's was filling up fast, with families sitting at the craft tables, but also about 200 adults standing in circles all around the edges of the hall ready to join in. By the time we started the St Philip's Hall was packed, and had a really cosy and friendly atmosphere ready to welcome everyone to the Rhythm, Rhymes & Railways concert. The event started with a welcoming speech by the Director of Historyworks, Helen Weinstein, who explained that t number of artists had been involved in this public art project funded via S106 funding at the Cambridge City Council, and that there was an accompanying sculpture project for Romsey celebrating the railway heritage with the making of the Romsey R sculpture, for which a model was on show at the concert, and the artists Will Hill and Harry Gray, so that the community could talk to them about this connected artwork too. Helen showed old photographs and maps of the Mill Road area showing change from the past to the present, from the times before the railway and the motor car when Romsey was mostly fields before the coming of the railway in 1845. The singers and audience learnt that over 20 sites were suggested for the station and the University kept on objecting, not wanting the students to be distracted or the noise of the railways to infiltrate the hallowed courtyards of the University. So the station ended up being located a mile from the market place, but once built, industries soon moved to the Mill Road area, including Headleys Engineering when they moved the Eagle Foundry from Cambridge Market place to be adjacent to the Railway Crossing at the site which is currently the Council Depot. The audience also viewed a funny picture of the Eagle Engine built by Headleys, the only train engine to be built in Cambridge, and this was followed by a song called 'Eagle Engine Number Nine, Running Down the Cambridge Line' and a song about the University saying "You can't drive your Train through my part of Town, Go through Romsey!" 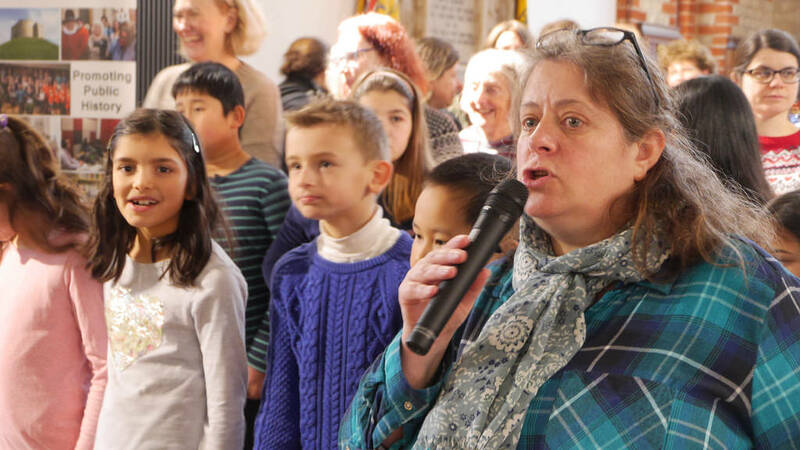 Helen explained that these songs had been learnt by all the primary schools, not only the choirs, but entire schools in Singing Assemblies, so known to over 2,000 children who had loved these railway songs. The Year 5s in the participating primary schools had been involved in a special workshop with the renowned childrens' poet, Michael Rosen, who had written several lyrics especially for our Rhythm & Rhymes project and had involved the children in co-creating new poems about the Mill Road area in the Victorian era. One of the poems we had written together with a riff based on research by Historyworks shared with the children about the Victorian Feast on Parker's Piece in 1838 just went "Victorian Feast on Parker's Piece", and another had a chorus to which children had composed lots of verses with the riff "Feel the Rhythm of the Train, Feel the Rhythm of the Train." However, it was not only the children involved in the project who were exposed to exceptional artists and challenged to co-create an artwork together. Those who had signed up for the Railway Singers and the flyers distributed around Romsey also invited the public to join us for a Sunday afternoon to make a soundscape. This was a reenactment of a steam train journey from Cambridge Station to Hunstanton, which was the destination that the elders' club at St Philip's called 'Friday Friends' had as their main memory of a train journey in the age of steam when they had gone on annual day trips to the seaside. The Historyworks team looked at old footage available online from the archive at the National Railway Museum and famous rhythmic poems in the era of steam, such as th Night Mail written by W.H. Auden, famously narrated by John Grierson: https://www.youtube.com/watch?v=zmciuKsBOi0 In our workshop we co-composed a journey with episodes we could re-enact using voices and body percussion, such as going through tunnels, passing other trains, experiencing a rain storm, braking and squeeling to a halt with a hiss at the final destination! We had great fun making the soundscape at the workshop, and the singers and audience sat down with their eyes closed for this new art sound installation, scored by Bethany Kirby, and sound recorded and edited by Mario Satchwell. The next section of the concert focused on the workers who came to Cambridge to build the railways, and the new workers and their families who settled in the area. Helen Weinstein, explained about the historical records which showed that migrant workers who came to build the railways, cutting through the railways and laying the tracks, were called 'Navvies', short for 'Navigators' whose skills were used for building canals prior to the railways. This was the subject of the song called 'Cambridge Navviews' composed by Patrick Olsen and arranged by Bethany Kirby, which was brilliantly sung by the primary choir from St Matthews. Then we saw pictures of the Railway workers themselves and the document of the Census listing a huge array of skilled workers, such as shunters and inspectors, porters and signalmen, and how these long lists had been artfully composed into a song for the project by CBBC's Horrible Hisories songwriter, Dave Cohen. The song is called 'The Mill Road Railway Workers' and the children loved the accompanying actions taught by Rebecca Powell of stagecoach, which helped them remember all the words for traditional workers on the railways, both in the station and in the maintenance and goods departments! 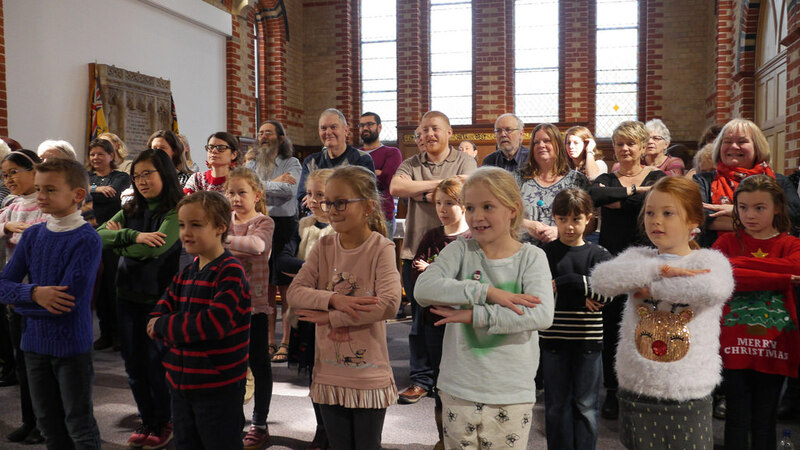 It was huge fun and the children got a rousing round of applause at the end of their song, which Mario Satchwell had the last verse sung as an encore. The final phase of the concert moved from folk and soulful numbers to a gospel medley. For the first gospel numbers we had the well rehearsed voices of Sing! 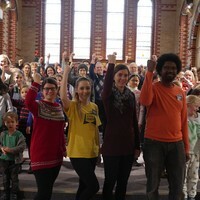 Community choir to join forces with the other singers for an uplifting joyous number called "Freedom Train' which was composed by Rollo Dillworth, with a curtailed arrangement for the concert by Mario Satchwell and Bethany Kirby, with fantastic actions by Rebecca Powell. We have all had great fun in the Thursday night choirs and the Sunday afternoon workshops in November, rehearsing and almost perfecting this number. No one will forget the dynamic energy of this rendition! 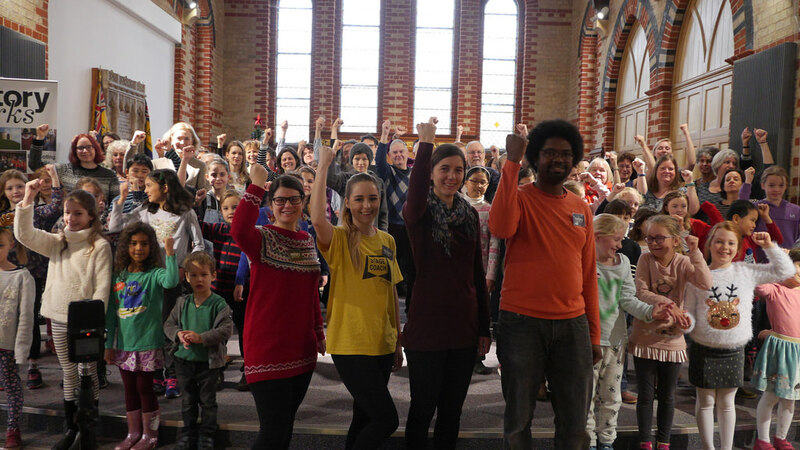 As a finale the singers with the help of Mario had the audience learn the round 'This Old Freedom Train' which is a traditional gospel song, whose rhythm and rhyme is infectious. All the children in the primary songs were addicted to this song, and the audult community choirs loved it too! It was a great number to end on before all the singing and action teachers were thanked, especially the Musical Director of the Railway Singers Mario Satchwell, the musical arranger Bethany Kirby, the movement teacher Rebeccca Powell, the assistant for producing the event Tizzy Faller, and the Creative Director who had commissioned the pieces and found funding for the project Helen Weinstein. The concert was designed to be very participatory, with the words up on the big screens, so it was easy for the audience to add their voices too. We did NOT be parade afterwards to the corner of Cavendish Road because the new sculpture will now be unveiled in the Spring rather than on the day of the Winter Fair, so we will save this treat for 2018 to sing at the Romsey R! !